Muireann Irish, whose work in cognitive neuropsychology was fueled by her grandmother’s struggle with Alzheimer’s. A grandmother’s legacy lives on in the work of Muireann Irish, whose research has shown that people with dementia don’t just lose the ability to remember the past, they also lose the ability to envisage the future. One of my favorite memories of my grandmother, Molly Lowney, is calling in to her house every day after school to chat about the day over a cup of tea. On Fridays, Nan would bake her legendary apple tarts, and I would arrive in to the smell of pastry and hot tea. Her house on St. John’s Road in Wexford became a second home for myself and my brothers. We would spend sick days snuggled under a blanket while Nan fetched us soup and sometimes, for a treat, I would stay overnight with Nan to be woken up in the morning with tea and “Ready Brek” in bed. These memories are very important to me and ones that I hope to pass on to my son. The diagnosis hit our family like a grenade. Back then, we knew so little about Alzheimer’s disease that Nan’s diagnosis came as a huge shock. There was a ripple effect that brought so many questions with it – Should Molly stay in her familiar surroundings at home? How advanced is the disease? What happens next? Is there medication? Will it help? What can we do? One of the worst aspects was the lack of understanding that we all had – we watched the disease unfold feeling increasingly helpless. Molly Lowney, “Nan,” worked as a midwife when she was younger, before being diagnosed with Alzheimer’s. What made the onset of Alzheimer’s disease such a cruel twist of fate for Nan was her fantastic memory. She had been a trailblazer, establishing her own midwifery service for the local community and running her nursing home single-handedly. Her memory was formidable – Nan could recall the name, date of birth, and birth weight of every child that had been born in her care. She would astound us with her memory of local events and families and was often called upon as the authoritative source during any disagreements. 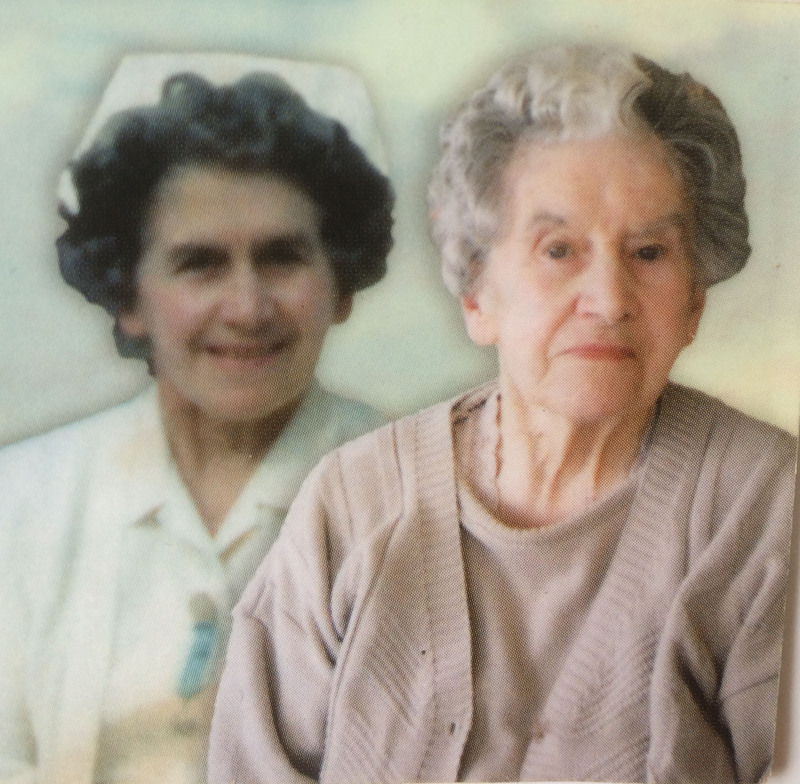 Nan had been a nurse in England during the war and retained the stoicism and resilience characteristic of that generation. She was a strong matriarchal presence in an Irish culture that revolved around community. Her house, “Ivera,” was cozy and warm, with the regular ticking and chiming of clocks. Visitors were always popping by, ranging from old friends to the parish priest. If Nan was not present at Mass, it would trigger alarm from her friends who would all arrive at the house to make sure that she was alright. By the time I turned 16, I was staying overnight at Nan’s house regularly. Her memory was fast deteriorating and she was becoming increasingly confused. At night, she would come into my room thinking that I was my mother and my efforts to quell her anxiety often failed. What was particularly difficult for my mother was Nan’s persistent questioning as to where her husband, Mal, was. Mam would say, “But Molly, Mal is dead,” unable to comprehend how Nan could have forgotten this. As we know now, Nan was simply unable to encode this new information and so she would experience the loss and grief all over again. We soon agreed not to confront Nan with such truths and would instead try to talk about what made sense to her at that point. As Nan’s condition worsened, my path in life became clearer. I had always had an interest in science – my mother was a science teacher in the local high school and I would often flick through her biology and physics books. I loved drawing on graph paper and being able to use big words, like photosynthesis, from a young age. My dad was also a teacher and an artist, so we had a lovely mix of science and art in the house. I grew up in a very egalitarian household and watched my parents divide the running of the house evenly. Growing up with two brothers also meant that I was exposed to much more than the traditional gendered toys of dolls and tea sets. I had a Transformer and a Mr. T figurine from The A-Team, and watched programs such as MacGyver and Quantum Leap. I was the quintessential tomboy! I found myself gravitating towards studying medicine at university, until my mum reminded me of my squeamishness with blood. Ultimately, I picked psychology and moved to Dublin to study at Trinity College. There, I was exposed to all different facets of psychology, but things clicked for me during a third year cognitive neuropsychology course. I remember sitting in the lecture theater thinking, “This is what I want to do,” and feeling a new sense of direction. As part of that course, I had to present a case study on memory and began reading up on memory disruption in dementia. First, I wanted to understand what was happening to Nan, and then I realized that this was an area of research I was truly passionate about. Later that year, a serendipitous opportunity arose for me to study the use of music as a cognitive enhancer in dementia. I commenced my honors dissertation at St. James’s Hospital in Dublin and felt a sense of purpose at the prospect of exploring a novel means to improve memory in dementia patients. I remember traveling back down to Wexford, armed with my new knowledge, and visiting Nan in the nursing home at Knockeen, Barntown, where she was now living. This facility was established by an incredibly generous woman, Mary Doran, who showed a sensitivity to the individual circumstances and life history of the residents that was truly inspiring. Recognizing that Nan had been a nurse, Mary encouraged her to “go on the rounds” giving out biscuits and assisting with the tea breaks. It gave Nan a sense of purpose and resonated with the fact that she believed she was back on the wards. In the final year of my degree, we gathered for Nan’s 86th birthday. At the nursing home, they made sure that her hair was nicely done and we had a cake to celebrate. Nan was sitting in her chair but largely silent – her speech had deteriorated and she could only communicate with single words or sounds. She was thin and frail, a shadow of her former self. We learned to be tactile; holding her hand, stroking her hair, and talking gently to her without expecting her to reply, although sometimes she surprised us and would talk with such clarity that it made me wonder what her internal experience was truly like. At the end, the hardest thing for all of us was seeing Nan bed-bound with ulcers. Visiting her was now extremely emotionally painful – we desperately wanted her to be released from this existence yet felt guilty for thinking this way. The last time I saw her she couldn’t talk, but she grabbed my hand and tried to murmur something. Her eyes looked so pleadingly at me, I knew that she recognized me and was beseeching me for something. I just didn’t know what it was. She died shortly after. That was 15 years ago, but Nan’s legacy lives on in my work. I went on to complete a Ph.D. in cognitive neuropsychology and then moved to Australia where I established my own research lab at the Brain and Mind Centre, Sydney. Every day, we chip away at understanding how damage to the functional networks of the brain impact memory processes, hopefully moving closer to developing strategies to enable individuals living with dementia to stay connected to their past.